Well, if you ask me, the poster for this movie is a tad misleading. I know this poster was made way after the movie and references Final Destination so it should give some indication as to what this film is about. But I don’t look at taglines; I look at pictures! 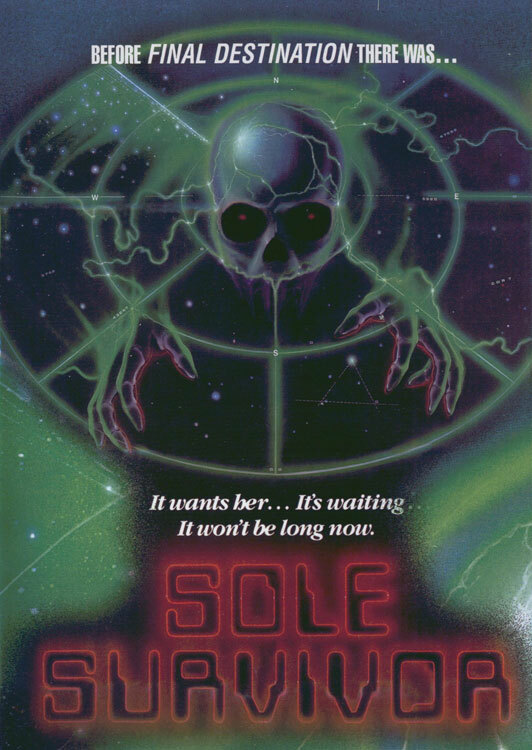 And, as far as I was concerned Sole Survivor from writer/director Thom Eberhardt, appeared to be some sort of sci-fi/horror hybrid involving a futuristic ship picking up an apparition of some sort on its radar screen. Just look at that picture and tell me you wouldn’t assume the movie is about that! Alas, it’s not. It’s about fate (huge sigh), hence the tagline on the poster. I don’t like when religious/philosophical themes are dressed up as horror films because I honestly don’t care about this kind of crap. I don’t believe in fate or any of that nonsense so when the movie’s lead character is being chased around by an apparition, the last thing I want to picture that apparition coming from is God! It sort of undermines the whole “scary” and “evil” thing for me. But, hey, it was still a pretty compelling movie even if the ending left me cold. Granted it was unexpected but I didn’t want it to happen since it made God the hero and the characters the villains or at least “destined.” That’s my take on it. Sole Survivor is about a TV actress named Denise Watson (Anita Skinner), who is the only person to survive a plane crash. Her doctor/love interest Brian Richardson (Kurt Johnson) warns her that people who survive this type of stuff get the notion that they’re invincible and do crazy things like walk out in traffic, “testing” death. But because Watson is smart and logical, she takes it all in stride. Of course, in a movie dominated by fate, this simply won’t do. So poor Watson basically is forced to survive near death experience after near death experience among which include a failed elevator and driving her car off the road. Oh, and for some reason, all of it is caused by dead people who come back to life at the hands of some crazy medium. Yeah, I know, it doesn’t make much sense. There’s this crazy woman named Karla Davis (Caren Larkey), who keeps having visions that predict Watson’s demise. Why? I don’t know what that has to do with the rest of the movie but corpses come back to life. So why did I give the movie three out of four iron crosses? Because it was entertaining and there were some neat scary parts in it. And I thought the Watson character was kinda cute (what can I say? I like sassy red heads). There were some neat shots of dead people coming to life and there were a few moments of suspense and there was a pointless but titillating game of strip poker. The gore was kind of minimal save for the wicked plane crash at the beginning of the movie over which the camera pans over the carnage. This gives false hope since there is only very minimal gore throughout the rest of the movie.